“La! You are so strange! But I must tell you how it went off. We were married, you know, at St. Clement’s, because Wickham’s lodgings were in that parish. And it was settled that we should all be there by eleven o’clock. My uncle and aunt and I were to go together; and the others were to meet us at the church. Well, Monday morning came, and I was in such a fuss! I was so afraid, you know, that something would happen to put it off, and then I should have gone quite distracted. And there was my aunt, all the time I was dressing, preaching and talking away just as if she was reading a sermon. However, I did not hear above one word in ten, for I was thinking, you may suppose, of my dear Wickham. 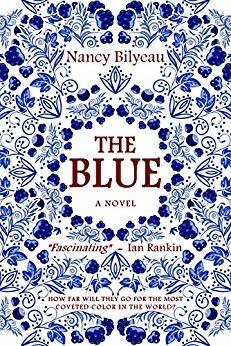 I longed to know whether he would be married in his blue coat. 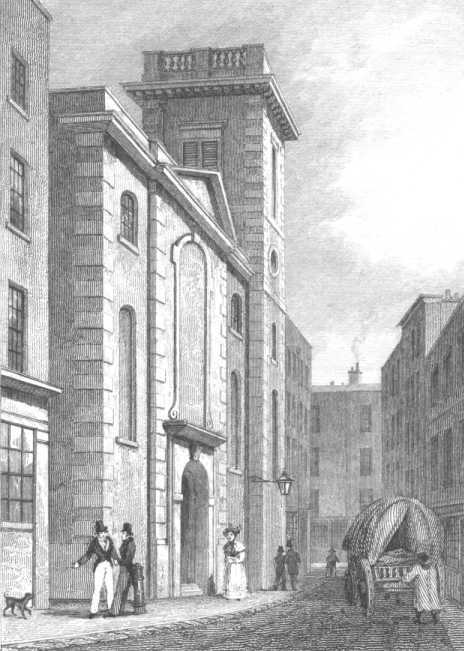 When Lydia remarks that “We were married, you know, at St. Clement’s, because Wickham’s lodgings were in that parish.” – she gives a clue that perhaps contemporary readers would not have found confusing, but we are left with not being completely sure which St. Clements she is referring to: St Clement Danes in the Strand, or St. Clement Eastcheap. Neither is mentioned in her extant letters. 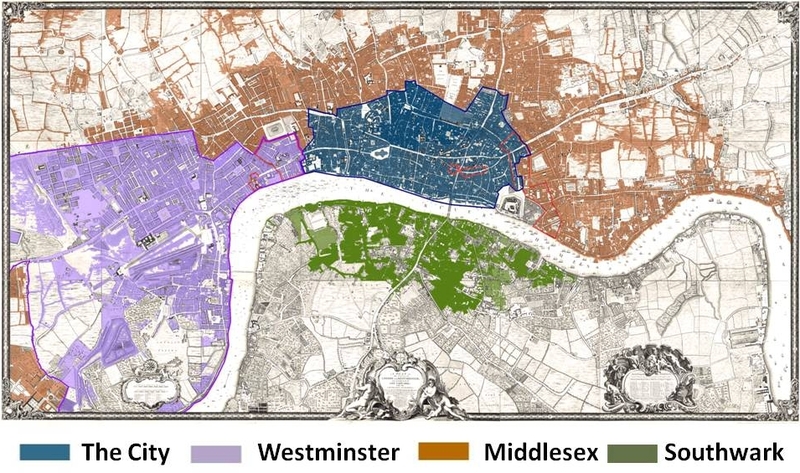 Pat Rogers notes in her 2006 Cambridge edition of Pride and Prejudice that the fairly large parish of St. Clement Danes had a population of 12,000 in 1801 and “contained areas of cheap lodgings and some raffish districts, notably a part of Drury Lane” (531-32). Most who have written on this would agree (see Kaplan and Fullerton cites below), largely because the other St. Clement (Eastcheap), on St. Clement’s Lane between Lombard Street and Great Eastcheap, would have been too close to the Gardiner’s who lived on Gracechurch Street [see maps for location of both churches]. Wickham would not have placed himself in such a smaller parish, with a population of 350 in 1801 (Rogers, 531), and so close to those who might find him out. Another reason that Rogers selects this as the best option is that in order to marry in this parish, one of the parties had to have residence there for fifteen days (Rogers, 532). 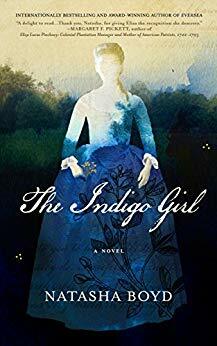 Laurie Kaplan adds that “the length of time required for residency functions perfectly for the elopement plot of the novel, for tension increases the longer Lydia and Wickham remain unmarried” (Kaplan, 7). But we know Wickham had no mind to marry Lydia … .another story entirely… (the text is very clear on this: Mrs. Gardiner relates to Elizabeth: “…it only remained, he [Darcy] thought, to secure and expedite a marriage, which in his very first conversation with Wickham, he easily learnt, had never been his design.” (357). 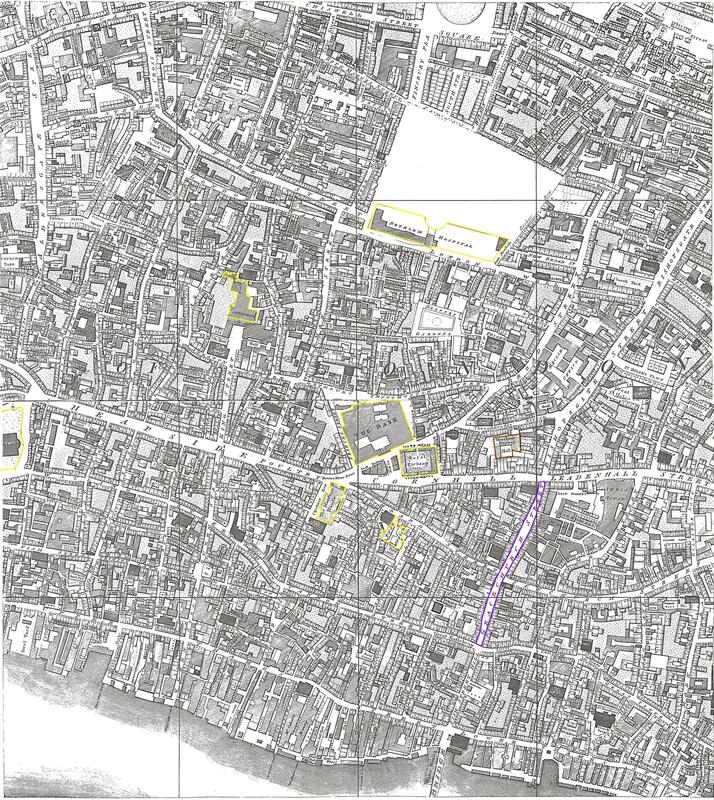 opposite the Royal Courts of Justice, the Temple and Fleet Street – on the map above circled in purple. 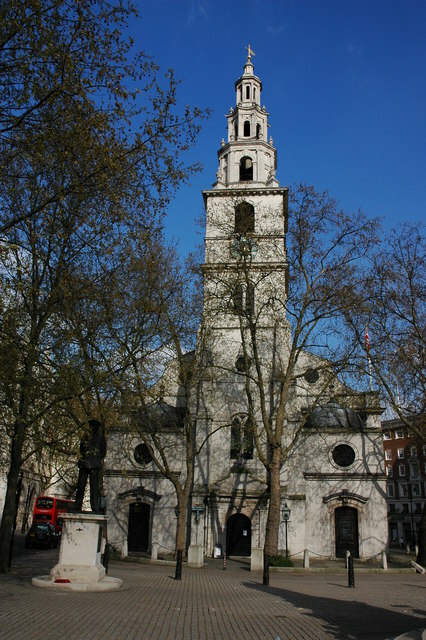 St. Clement Danes: The first church on the site was founded by Danes in the 9th century, and named after St. Clement, patron saint of mariners. It has been rebuilt by William the Conqueror, later again in the Middle Ages, and rebuilt yet again in 1680-82 by Christopher Wren, a steeple added in 1719-20. It was gutted during the blitz, only the walls and tower left standing, and since reconstruction has served as the central church for the Royal Air Force. 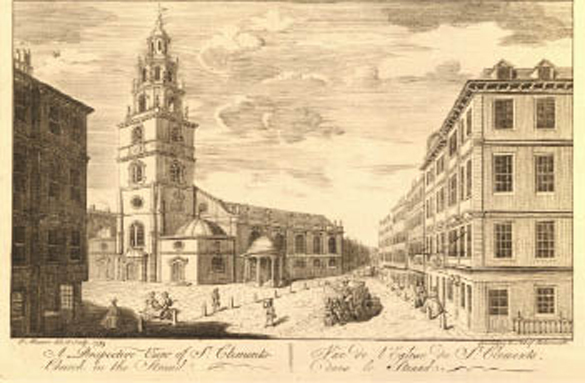 An early street view of the Strand and St Clement Danes Church, 1753. On the right is the original entrance to the building. cTrustees of the British Museum; image from Christina Parolin, Radical Spaces (ANU, 2010). St Clement Danes today: when in London in May 2011 I visited the Church for the first time, finding it a quite lovely and peacful setting on its little island in the midst of bustling London – here are a few shots, alas! not that well focused and no exterior shots of the facade, so I include one from Geograph.org.uk, with thanks. 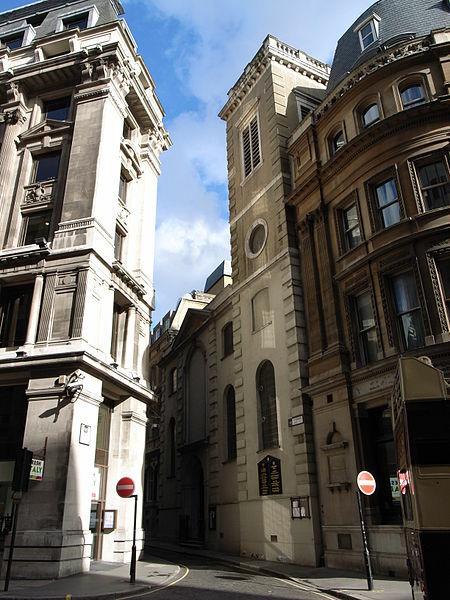 go one block to the left to find St. Clement’s Lane, the Church is on the right. The St Clement argument does not just revolve around Jane Austen [and indeed may she just been throwing out a very sly reference to her sailor brothers? – just a thought, St. Clement being the patron saint of sailors] … The Churches apparently have a long-standing “quibble” over which is the St. Clement referred to in the nursery rhyme “Oranges and Lemons” – here is the full rhyme: [the long version from wikipedia: http://en.wikipedia.org/wiki/Oranges_and_Lemons ]. It is the bells of St. Clement Danes that ring out the tune of the rhyme three times a day. Gay go up and gay go down, To ring the bells of London town. Oranges and lemons, Say the bells of St. Clements. Bull’s eyes and targets, Say the bells of St. Margret’s. Brickbats and tiles, Say the bells of St. Giles’. Halfpence and farthings, Say the bells of St. Martin’s. Pancakes and fritters, Say the bells of St. Peter’s. Two sticks and an apple, Say the bells of Whitechapel. Pokers and tongs, Say the bells of St. John’s. Kettles and pans, Say the bells of St. Ann’s. Old Father Baldpate, Say the slow bells of Aldgate. You owe me ten shillings, Say the bells of St. Helen’s. Pray when will that be? Say the bells of Stepney. Chip chop chip chop, The last man’s dead! And finally, to bring this back to Jane Austen, where all begins and ends after all, there is behind the St Clement Danes church a statue, by Percy Hetherington Fitzgerald and erected in 1910, of all people, Jane Austen’s very own Dear Dr. Johnson. I think she would be pleased, don’t you? 1. Laurie Kaplan. “London as Text: Teaching Jane Austen’s “London” Novels In Situ.” Persuasions On-Line 32.1 (2011). 3. Susannah Fullerton. Celebrating Pride and Prejudice (Voyageur Press, 2013). 7. Google Maps of Jane Austen places in the novels: this site notes that the St. Clements in is Eastcheap – you can zoom in here in the London area and choose locations. 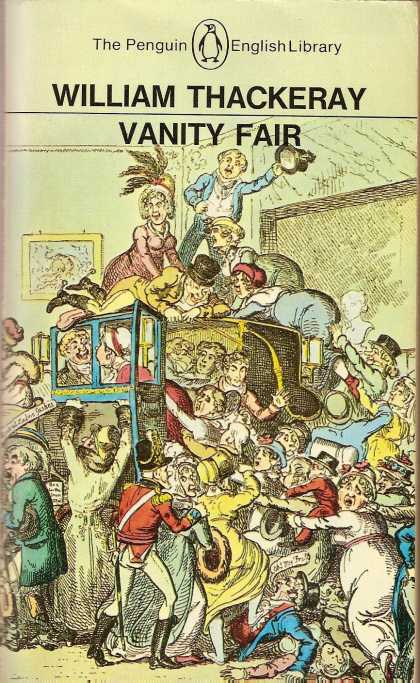 This entry was posted in Austen Literary History & Criticism, Great Britain - History, Jane Austen, London, Regency England and tagged Christopher Wren, Churches, George Wickham, Jane Austen, London, London Churches, Lydia Bennet, Oranges and Lemons, Pride and Prejudice, Samuel Johnson, St Clement Danes, St Clement Eastcheap. Bookmark the permalink. ← Winner of ‘Jane Austen in Love: An Entertainment’ by Elsa Solender! Hello Joe! – thanks for this – though the fact is that the Eastcheap church is close to the route of fruit porters as well – so hence the dispute of how the rhyme came to be… I don’t think we shall ever really solve either riddle, but horrible of Taylors to not bring Austen into the discussion – I should indeed have searched more about the rhyme, but alas! 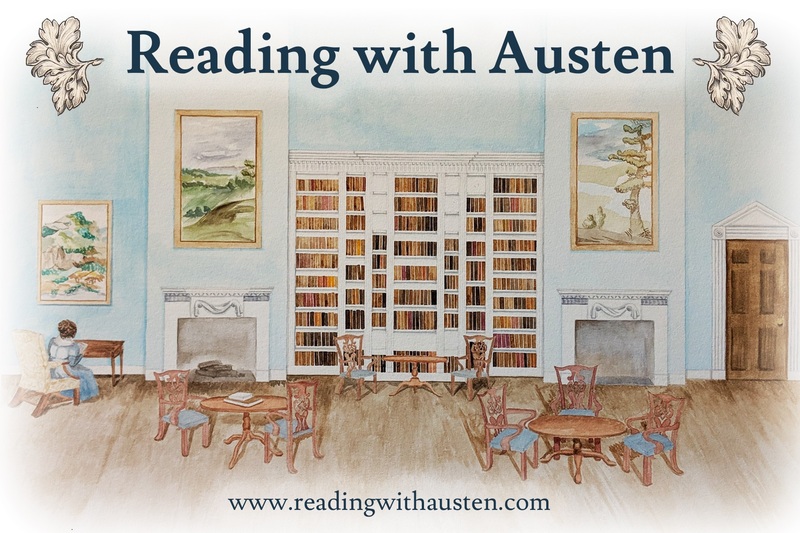 can only go so far afield from Austen without that pull back to what life is all about! Thanks for stopping by – knew you would be pleased with a London post – next up is the enigma of Edward Street, even more of a dilemma than St Clement, and no rhyme in the mix for entertainment. Know anything about it? I am suffering Londonitis – how about you? St Clement Danes and no doubt Clare Market would have been absolutely familiar to Jane Austen, both being only a few minutes walk from Henry’s house in Henrietta Street. You remarked that all topics lead back to Jane, and in this case they also lead back to Janine Barchas. Clare Market is said in a number of sources (notably just now by Joe Trenn) to have been established by John Holles, 2nd Lord Clare. John’s sister Arabella married Thomas Wentworth, Baron Wentworth of Wentworth Woodhouse. Just to throw a spanner into the works. Hello Ron, yes, all does seem to come back to Austen, whether we are talking about churches, London markets or fruit! – and thank you for being there to connect all the Dots! – and reiterating about the Wentworth connection as explained in Janine Barchas’ book Matters of Fact in Jane Austen. Really enjoyed this, Deb – especially as I too have been suffering Londonitis! It’s been way too long, and your photos reminded me of my own rambles there. 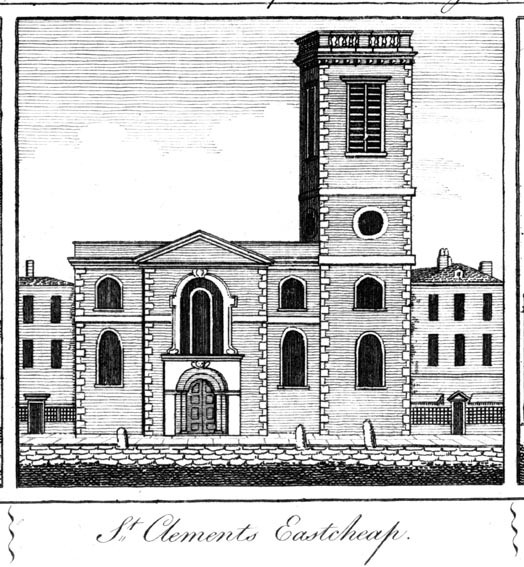 Regarding the Eastcheap St Clement, is there any possibility that if this was the church in question, it was because Lydia has been residing with the Gardiners nearby that they could be married there? She did stay with her uncle and aunt for a fortnight (per the P&P timeline arriving on 17 Aug and marrying on 31st, the 15th day). Just another thought on the subject… to muddy the waters further, LOL. Can’t wait to read your thoughts on Edward St.
Hello Tess, yes good point – I had not gone in to look at the timeline but do know that Lydia did stay with the Gardiners for two weeks or so after Darcy found them: Mrs Gardiner says in her letter: “Lydia came to us; and Wickham had constant admission to the house.” If Wickham remained in his lodgings and needed to be there for the 15 days to get the license as required by the St Clement Danes parish, then they would have had the wedding at Danes. But could they not have gotten a special license and married right away anywhere? But your thought that as she was staying on Gracechurch St the Eastcheap St Clement would have been closer is correct and just does muddy the water further! No explanation is given for the lapse of time other than Darcy leaves for Pemberley and will return for the wedding and “all the money matters were to receive the last finish.” – though by having Lydia stay with the Gardiners, it gave it all a show of respectability which I am assuming was one of the main reasons for the delay…? as well as figuring out all the settlement on LYdia and the payment of Wickham’s debts. This is why Jane Austen requires extensive re-reading! – and we are still no closer to the truth of it. Thanks Tess for this – I am going to ponder this all day! – and just when all I had going around in my head was “Oranges and Lemons”! Oh how exciting that you brought this up! In fact when I was younger, I spent a December selling xmas cards for charity at St Clement Dane’s but I never noticed that Jane Austen had mentioned the church in this context!! Amazing! 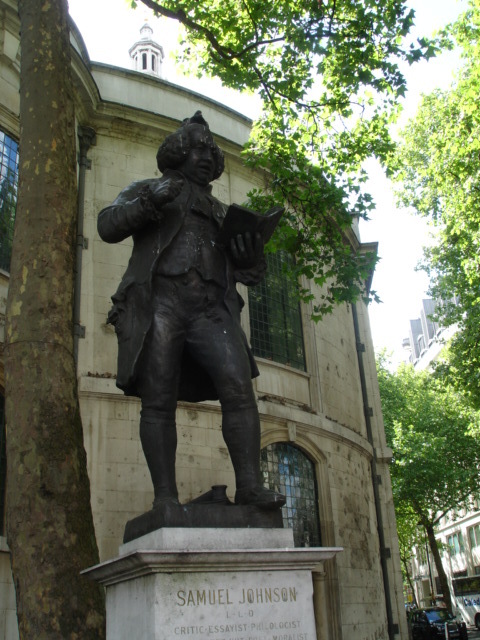 How lovely for you to spend time at St Clement Danes – it was so peacful inside, I spent quite a bit of time there just walking around – the emergence into the crush of modernity was quite the shock and why I was so glad to find Samuel Johnson around back! 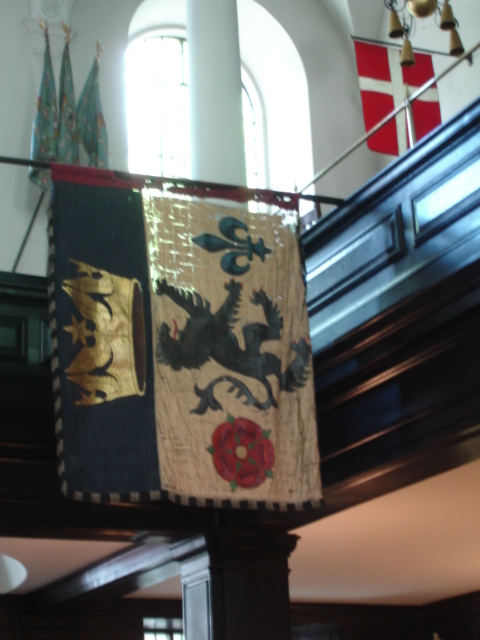 St Clement’s Eastcheep or St Clement Danes ;which one saw the marriage of Lydia and Wickham? Both are Wren churches, designed and rebuilt by him after The Great Fire of London. 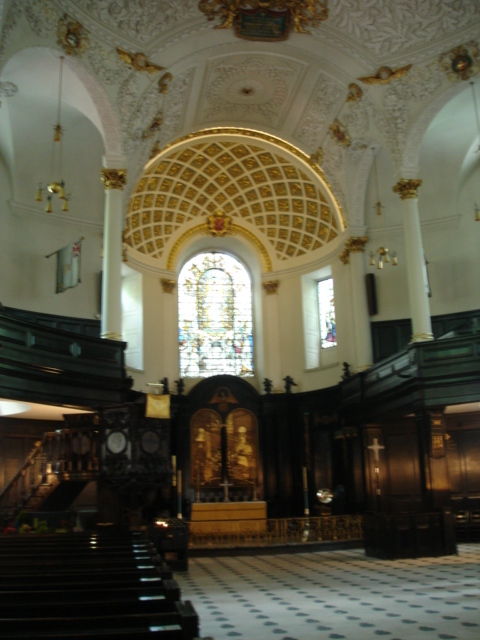 St Clement Danes, in The Strand is by far the more elaborate and famous of the two. 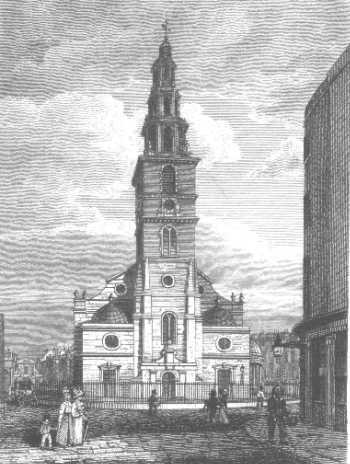 The Eastcheap church was one of Wren’s plainest designs. When Pride and Prejudice was eventually published iin 1813 it had had a reasonably long gestation period. 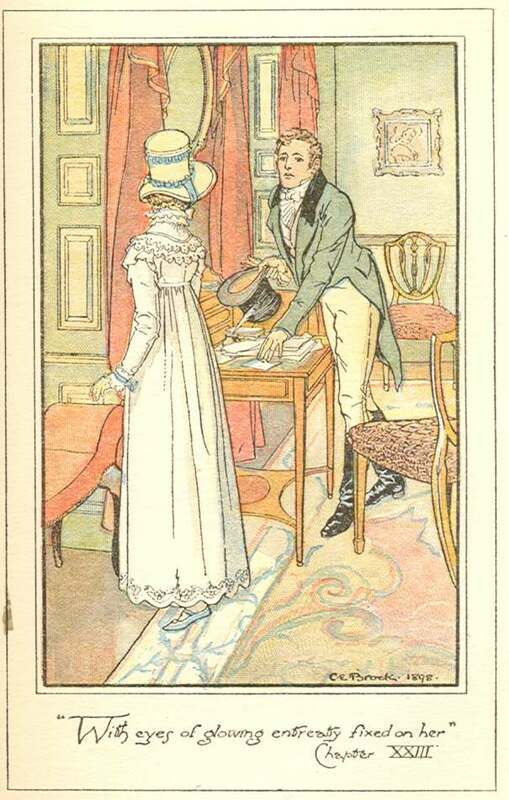 Jane Austen began it in 1796 and originally called it, First Impressions. 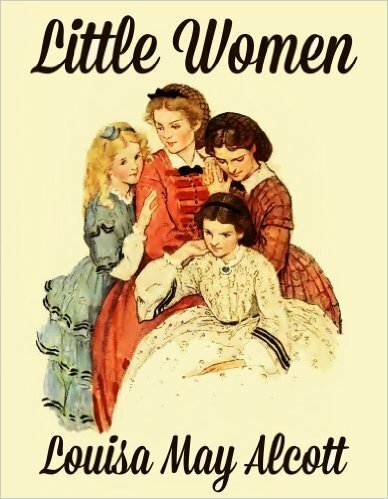 This early version was turned down by publishers. However by 1813, when Thomas Egerton of Whitehall ( his office was opposite the Old Admiralty building on the site of the Old War office in Scotland Yard) Henry, Jane’s brother had the London branch of his bank situated at number 10 Henrietta Street next to Covent Garden. 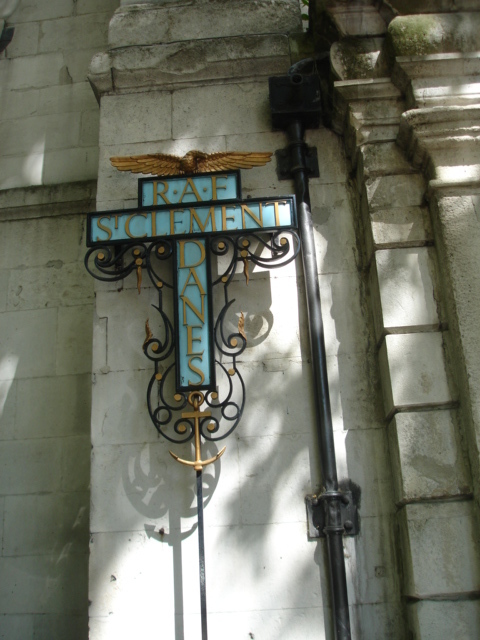 Anybody living there and frequenting Drury Lane Theatre and buying their tea at Twinings in The Strand would talk of St Clements and they would undoubtedly mean St. Clement Danes in the Strand. It is less than half a mile from Covent Garden and Henrietta Street and is directly opposite Twinings. Jane may well have attended services there, it is so close to where she stayed with her brother . St Clement Danes was also the scene of scandal which Jane would have known about and would have ignited her imagination. In 1725 a portrait hung in the church which everybody thought depicted St Cecelia. However it was discovered that it was actually, Princess Sobieski, the wife of the Pretender, and promptly removed. The location of a portrait scandal may have inspired Jane to set another scandalous moment on the same spot. Who knows? It is also the church of Samuel Johnson, the burial place of John Donnes wife and also the burial place of one of Shakkespeares best actors John Lowin. All this would have been known to Jane Austen and maybe impressed her. is capable of any twist and turn in her writing just to spite everybody’s views and expectations, for fun no less. So she could have had St Clements in Eastcheap in mind just for the hell of it. You might say, well the Eastcheap church is a little close to where the Gardners lived and Wickham would not have wanted to be caught out with Lydia, but sometimes the best place to hide is right under somebodies nose; the place nobody would suspect. I shall be posting my Egerton piece soon, along with your pictures of the area – so much to discover, so little time! Deb, i am not sure the Grangers could have applied for Lydia and Wickham. I thought the couple had to apply together. That is what usually happens these days.. 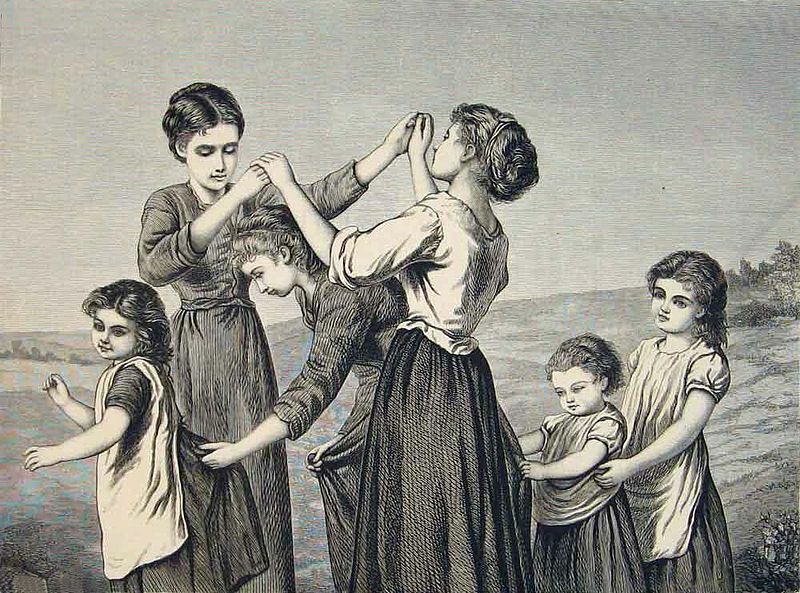 There is a law now against forced marriage. I don’t know what the law was in the 18th century. Has it changed that much? Wickham,if he was living now, could later have the marriage annulled because of duress, perhaps?. They probably didn’t consider that in the 18th century or did they? We need a lawyer with a knowledge of 18th century marriage law to sort us out Deb!!!!!!!! I am on it about researching licenses! 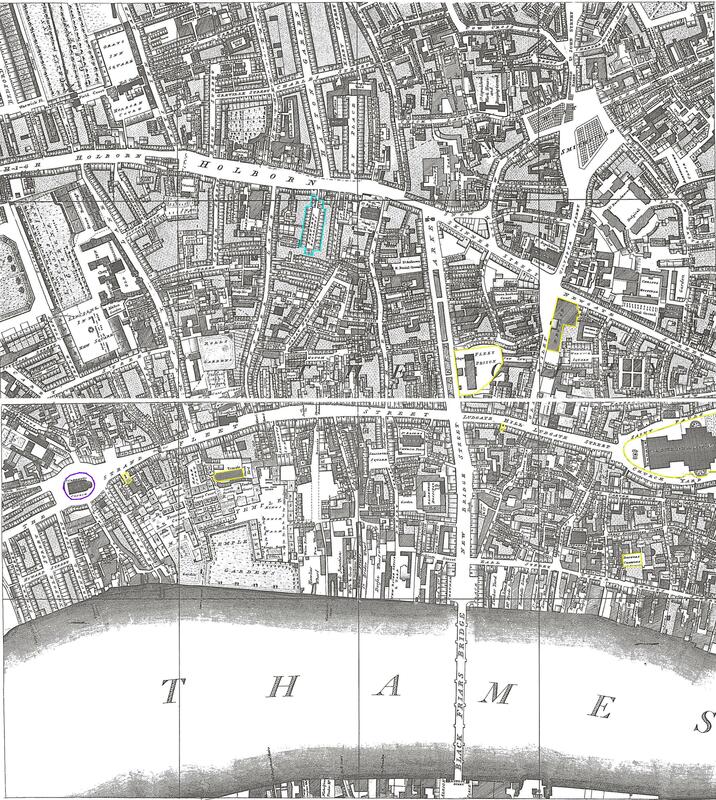 – this whole issue about St Clements goes deep into all sorts of issues – London topography and civil law – who said that Austen wasn’t aware of the world around her? – they must be certainly “stupid” to think she wasn’t giving us all sorts of clues to another world out there…would she not have realized that everyone would query “which St Clements?” for 200 years?! My totally unscientific opinion on which St Clements, is that Jane was so familiar with St Clement Danes that she didn’t consider the one in Eastcheap. A slightly more scientific opinion – in that I’ve frequently observed it in my own research – on marriage licenses, is that the “allegations” (i.e. requests) *could* be made by a third party. 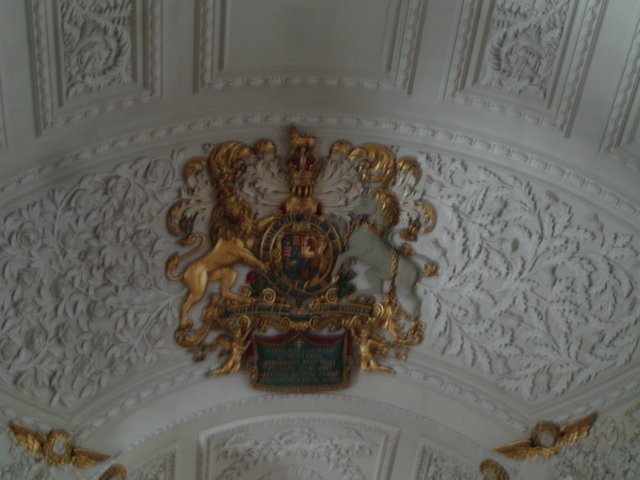 Since Jane used it, it mustn’t have been abolished by Hardwicke’s Marriage Act of 1753. Speaking of Hardwicke’s Marriage Act – until 1753, marriages in “the Liberty of the Fleet,” an area around the Fleet debtors prison (which had stood only about a mile to the east of Covent Garden) could be performed on the spot without formalities. A good overview can be found on this site: http://www.georgianlondon.com/fleet-marriages. One would expect that till 1753, Wickham and Lydia would have found a Fleet marriage the most convenient. There was an interesting and perplexing incidence of a Fleet marriage in Jane’s own family – her paternal grandparents, William Austen and Rebecca Hampson, married in that way on 13 January 1728. There was no compelling reason, as far as anyone knows, why they should have – she was a widow of at least 30, so responsible for herself, and he was unmarried – aside from the fact that it’s possible that neither of them resided in a London parish. Even that we don’t know. Thanks for this Ron – sometimes the “totally unscientific opinion” is the correct one! – the old “gut-reaction” thing. Interesting about the marriage license third party – one does wonder who did apply for it: the Gardiners on Lydia’s behalf or did Darcy drag Wickham to be sure he was committed. If Austen had this “Fleet marriage” in her family history perhaps why she did not have Lydia and Wickham do this – there was a full-out effort to make it all look respectable: Lydia staying with the Gardiners, Wickham visitng every day, the waiting the two weeks, etc… they were all into damage control..
We shall really never know shall we? The church used in the 1995 production for Lydia’s wedding is St. Paul’s, Deptford. A beautiful baroque church built by Thomas Archer.